Star Wars Themed Cars That Are Out of this World! Darkness rises and light to meet it even in a galaxy far far away. The saga of The Force continues in theaters in Lucasfilm’s latest motion picture event “Star Wars: The Last Jedi.” Meanwhile dedicated fans and even a few automakers the world over have celebrated their own unique way. From costumes to fan art, “Star Wars” is everywhere even places the Hollywood marketing empire never dreamed of. While the ultimate goal would be to one day travel to a galaxy far, far away in one of the iconic starships the series is known for: some fans have built the next best thing: they’ve modified their automobiles into the ultimate tribute to the series. From styling the bodies after famous characters to re-coloring their rides to recall the look of X-Wings and Millennium Falcons, these cars won’t be taking anyone into hyperspace but they will endear the imaginations of fans the world over. Nissan has made no attempt to hide their ambitions for creating the next generation fully autonomous car. We’ve even outlined their biggest developments just this year. 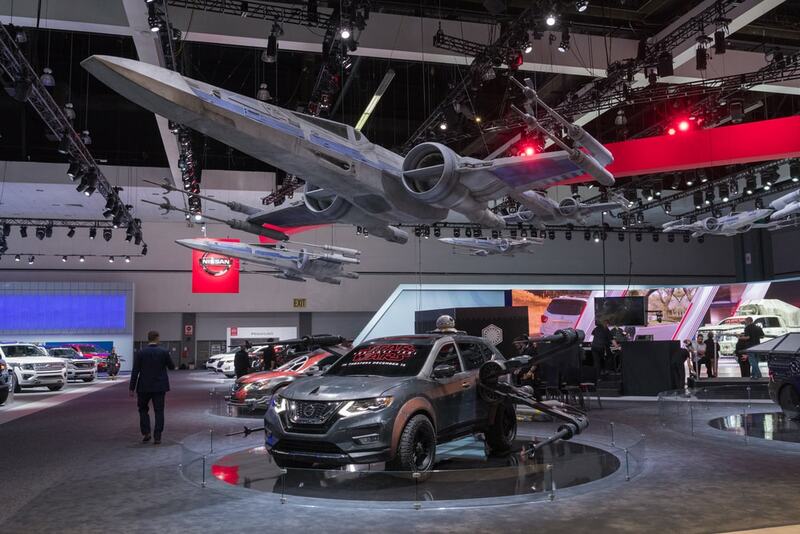 During the LA Auto Show Nissan turned to none other than Star Wars to draw inspiration and bring attention to their latest technological achievements. Hot off the heels of of their incredibly successful “Rogue One” partnership, Nissan gave both their fans and Star Wars something truly special when they revealed seven Star Wars-themed vehicles at the LA. Auto Show. Don’t count on buying any of these cars at a dealership. The elaborate designs are anything but road-safe with extended body panels and accessories modeled after iconic ships and characters. These aren’t the cars you’re looking for…on the lot. In addition to showing off the out of this world automotive art, Nissan also gave fans a unique virtual experience where they could “pilot” the cars and even build their own. Parked in Jay Leno’s garage on an episode of his series is none other than a Hot Wheels Darth Vader tribute car. Bryan Benedict, a senior staff designer at Hot Wheels, says that the car is a celebration of the collaboration between Hot Wheels and Lucas Films. What Leno finds most impressive is that this isn’t just a one-off with a block of wood underneath, either. It’s based on a C5 Corvette with a manual six-speed gearbox. Once you get past the Vader breathing sound effects (because the car does breathe) you’ll hear the familiar rumble of an LS3 V8. Who know Darth Vader was a Chevy guy? Benedict says he wanted this car to be a “vehicular expression” of Star Wars in pop culture, and we think he absolutely nailed it. This 1994 Honda Del Sol has been completely outfitted to match Luke’s X-Wing from the original 1977 “Star Wars.” It’s got nearly everything I could expect from a mid-sized economy sports car turned intergalactic space fighter. From the accurately detailed R2 unit in the back (so much for that rearview mirror) to the side mounted guns with laser burns scorching the car near the tips, this is clearly the work of some of a dedicated fan. While owning a Lamborghini Murcielago is probably enough of a head-turner in itself, it appears as if one Star Wars fan was still left wanting. The anonymous driver wanted to pimp his ride in time for the annual Gold Rush Rally, a sort of high-end Fast & The Furious style event. He approached Californian car specialists SS Customs with an idea to transform his car into the ultimate Star Wars shrine. After an impressively stressful three days, “The Rogue Fighter” was the end result. If geeks start learning how to hotwire cars, this guy’s in major trouble. Given the extremes of Lamborghini customization, a temporary Star Wars theme comes off as an exercise in restraint. Team Golden Empire did mix-and-match from all sides, with Empire icons on one half of the vehicle and Jedi Order on the other. There’s also the subtle image of Star Wars mascot R2-D2 embedded in the roof. He may have only a handful of lines in the movies but a few action figures, comic books, novels and videogames later and Boba Fett, intergalactic bounty hunter has become as ubiquitous with ‘Star Wars’ as lightsabers. Artist Rebekah Stieg Knuth of Knuthart Studios posted photos of her out of this world Star Wars-themed Hyundai Veloster that she had covered in a Boba Fett-style vehicle wrap. Knuth, who has appropriately renamed her car “Ivor Fett,” did all of the graphic design and layout of the wrap before having it installed by Josh Bevers and Tom Hrubesky of Fastsigns in Appleton, Wisconsin. The color and patterns of the wrap mimic the now-iconic armor of the character complete with little details such as the “worn in” battle scars, his trademark insignia and his “T” shaped helmet visor extending from the windshield & side windows to the hood. This car is perfect for delivering recently frozen outlaws to Jabba the Hutt. Few of us knew very little about “The Force Awakens” before it hit theaters. And yet we searched our feelings definitely enough to know that an image of the infamous “storm troopers” means bad news for the heroes. This special edition of the Fiat 500e was built by Garage Italia Customs, likely just for the LA Auto Show and future Stars Wars: The Force Awakens promotions. The car was painted to look like a new Stormtrooper. It was “inspired by the armor of the First Order Legion (the moniker of the villains in the new film). The means a two-tone black and white custom painting of the car body. The black and white color hue continues inside where you’ll find a white dashboard with the Star Wars logo. There are also custom seats and even a themed steering wheel. There’s probably a lightsaber in the trunk (not really… we’re just assuming). The force is strong with these cars. You won’t find any one of these at a dealer near you. However, you could do worse than round up a few credits and let your creativity transport you. Or you could just drive to the movies, the galaxy is full of possibilities. Star Wars: The Last Jedi is now in theaters. If you’ve seen it, tell us what you thought but no spoilers please!